Becoming a social business necessitates that a company engages and collaborates with their different stakeholders: employees, users, customers, partners, suppliers, analysts, influencers…. in ways they haven’t done before. Adopting a social business model implies that a company connects the dots between their customer-facing department and functions to enhance the overall customer experience with their brand — one unified message through multiple touchpoints. I’ve spent most of my career in sales, business, and partner development positions working for global leading companies in the high-tech sector. Even though these companies are on the cutting-edge of technology, their management and operational structures are often fragmented, and decision-making processes are very linear. While they have a strategic intent to become more collaborative internally, and more engaged and closer to their customers, their size and culture make it much harder to adopt change at the speed that is required in today’s business landscape. This represents a golden opportunity for entrepreneurs and small businesses. I believe that there has never been a greater opportunity than today to be an entrepreneur or a small business. A social business will most likely outperform its competitors (and that includes large enterprises) because it is focusing on relationships with clients, partners, and employees by engaging new technologies and platforms (like Nimble) that powerfully and easily connect them in trusted and experiential way. But to take advantage of the power of small, what are the most important and productive changes you should make? How do you decide what aspects of social business to pull into your daily habits? In big companies, lots of different departments handle (and must try to coordinate) messaging. But in a small company, you are likely to be the one wearing all the hats — or at least with a lot more oversight over processes and workflow. That means that you have a better understanding of how communications, sales, marketing, channels, customer service, operations, and culture affect relationships with your customers. You can move quickly to coordinate the various pieces so that your customer has a more cohesive, personalized experience with your brand. This is a great opportunity for small business. With clever new tools (like Nimble), you are able to coordinate messaging across channels, set airtight schedules, and coordinate marketing communications, sales communications, and other content to a tee. Don’t Interrupt. Rather, Add Value. There’s nothing more jarring than to be participating in a friendly discussion on a thread or on Twitter and to be the target of an obvious sales pitch. This is exactly the opposite of what social business should be about. Social is about adding value, sharing opinions, finding common ground — not shouting at someone to buy your stuff. That approach will break trust, and you may never be able to regain their respect. Social business is genuine and authentic. For example: “I noticed you were interested in new tools to gather blog metrics. I saw this article the other day that might give you more insight. (link)” Now the dialogue is open; you are giving good information, not offering up a commercial for your product. Chances are that the person will respond with thanks, and the relationship can develop naturally. Consider your timing, too. Recent Twitter statistics show that people are engaging more than ever through Twitter — up 17% on weekends! — and if you include an image your tweet is more than twice as likely to be noticed. See Positive Results? Adjust Your Workflow! When you use helpful tools, it’s also easy to add the most useful social tasks to your daily workflow — especially if you begin to see the benefits quickly. For instance, put in place a process that helps you reach out to new contacts within a few days of your first interaction. 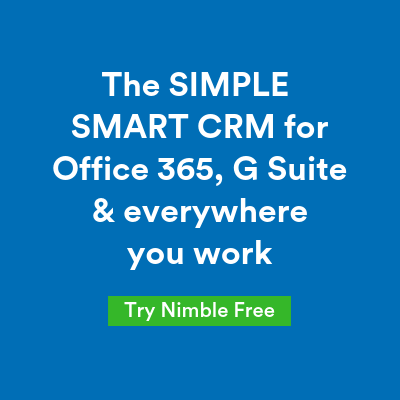 Nimble is a great asset for this activity because the system will remind you automatically to take an action or reach out to someone. Browse through your contact’s social streams, look at what interests them, and get a look at who they are interested in. Acquaint yourself with the overview of their digital footprint. What have they been talking about lately or shared with their network? Just before a phone meeting, for example, I check a contact’s social streams and see what’s happening in real time. When you’re not meeting face-to-face, it’s important to develop as full a view as possible. Even the most mundane of information, say a tweet about how deep the snow is in their city, can show that you’re in the know and feeling connected to them – it’s all about relatability – finding common ground, and demonstrating genuine interest. This kind of generous, real relationship building matches today’s model — a philosophy that aims at the relationship, not the sale. Sales will come and go along any relationship timeline — but no sale will ever occur if there is not a trust relationship and mutual respect. At the end of the day, it’s the human element that makes or breaks any forms of partnership, collaboration or alliance. A successful partnership isn’t just about the contract and the processes …it’s about people, relationships and trust. And those common bonds are ideally suited to social activities! Photo credit: The mighty pollen photo is courtesy of Wikipedia. 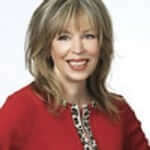 Francine Allaire is an award-winning sales and strategic alliance executive, working for global industry leaders such as Oracle Corporation, Sun Microsystems, Ariba, BearingPoint, and Computer Sciences Corporation (CSC). She has personally negotiated over $200 million worth of business solutions and strategic partnerships with companies worldwide. As a revenue acceleration strategist, Allaire helps companies profit from their sales, strategic alliances, channels, business development, and marketing initiatives by engaging customers and partners and by providing solutions that generate results. She has been responsible for leading global sales and alliances teams, developing long-term client relationships, and forming profitable partnerships. Allaire was named by Forbes as one of the “Top 20 Most Influential Women” on Twitter for business, marketing and technology advice.